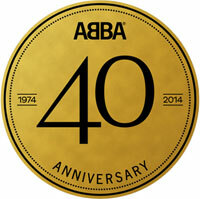 What plans are there for ABBA’s 40th anniversary? That’s a common question from ABBA fans at the moment. For months there has been speculation from fans and media alike that there will be some form of ABBA reunion, simply because it’s the 40th anniversary of ABBA’s Eurovision Song Contest on April 6th 2014. Agnetha added fuel to the fire in November last year when she said on German television “There are probably plans to make the occasion of this anniversary something” (see What Agnetha really said below). This was widely assumed to mean a reunion, though she didn’t actually say that, and later denied that was what she meant. Both Benny and Björn have denied that there will be any reunion, now or ever. In December Benny said that all four had met and decided “we’re not gonna do anything ourselves” to commemorate the anniversary (see icethesite for the full interview). There are of course many plans to celebrate the anniversary. In April Universal Music will release a Deluxe Edition of the Waterloo album, with bonus tracks and a DVD of TV performances. ABBA – The Official Photo Book, featuring over 600 ABBA photos (including 100 unpublished images) and a foreword by Agnetha, Björn, Benny and Frida, will also be released. Many other official and unofficial products are also in the pipeline. In lieu of any ABBA members taking part, ABBA The Museum in Stockholm is putting together a choir to perform at anniversary celebrations on April 4-6. The museum has put a call out to fans around the world for a chance to join the choir – see here for details. The Mamma Mia! musical will also celebrate its 15th anniversary in London. In his December interview Benny said that “some of us might pop over for that”. It seems that any celebration there will be on Saturday April 5th, as the theatre is dark on Sundays. The Dome in Brighton, England, which hosted the 1974 Eurovision Song Contest, is also hosting several ABBA-related events around the “ABBAversary” weekend. There is also an expectation that ABBA could be involved in the Eurovision Song Contest, to be hosted in May in Copenhagen, Denmark (just across the water from Sweden, you know). Though they haven’t commemorated the anniversary at Eurovision in the past. Benny and Björn didn’t even appear in 2013 in Malmö, for which they had written the grand final opening anthem ‘We Write The Story’ (apparently, they were scheduled to attend). The four former ABBA members themselves did nothing to commemorate any previous anniversaries, so it’s perplexing that so many expect that they will do something this year. In May last year for the opening of their very own museum Agnetha chose to visit London to promote her new album rather than attend, while Frida and Benny appeared reluctant about the attention. It would not be surprising that the member we may see is Björn.